Grandma Fancy Molasses contains residual nutrients so you get the delicious with the nutritious. Is your grandmas fancy 100% pure molasses unsulphured? Hi Tyler, Yes, our molasses is unsulphured. Your comments say the blackstrap molasses is unsulphured and the ingredients have Sulphites in brackets. Are those 2 words interconnected in any way. 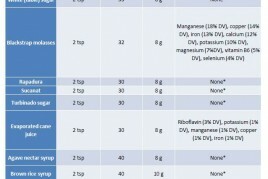 If someone has sulfite allergies and currently buys unsulfured molasses because of the allergies, could they use Grandma Molasses blackstrap molasses with that sulphites word in the ingredient list? I have to ask about the usage of this product , grandma’s molasses facny? can it be used for health purposes or its for dairy products only? is this unsulphured blackstrap molasses or different from it?i ihave fibroid tumour.and useage of blackstrap molasses can shrink fibroid .i used pure molasses for same problem but it caused me heavy bleeding that is why i m asking can i use it for health purposes.i bought this molasses from canada but it is only fancy molasses available in canadian stores.so tell me stores where i can find blackstrap. Hi there, Apologies for the delay. Our fancy molasses is used for cooking and baking. It is less nutrient dense than blackstrap molasses. 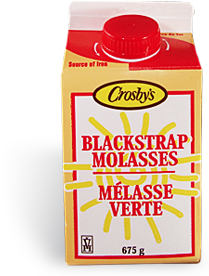 Our blackstrap molasses is available in parts of Atlantic Canada and in Western Canada. Hi Sharon, Grandma’s original molasses is Fancy molasses. It’s not organic but is non-GMO and made from pure sugarcaane with no additives. I use your product frequently in baking. I’ve recently come across a recipe that calls for unsulphered molasses. I’ve read the comments and reviews and you have stated that it is unsulphered. My question is to find out if there is a diffeeence between blackstrap unsulphered molasses and just unsulphered molasses? Is your product “blackstrap”? Hi Diana, all of our molasses contains no added sulfur. We do have different kinds of molasses, blackstrap having a more robust flavor. 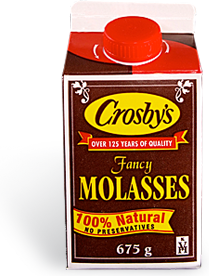 Grandma molasses is fancy molasses only. Our Crosby’s brand is available in fancy, cooking and blackstrap. If you are located in Quebec it won’t be easy to find our blackstrap but if you’re in Ontario you can look for Crosby’s brand cooking or blackstrap. They’re both robust in flavour (cooking molasses is 70% blackstrap and 30% fancy) but are also higher in iron than our fancy molasses. so the states don’t sell blackstrap? what is the iron content of the Original molasses? Robust? I am not seeing any information on this. Thanks. Hi I remember seeing on the molasses carton where it was produced. If my memory serves me right it was from Barbados. Why is it not indicated that anymore? Madeleine, Sorry for the late response to your question, which is a good one. The Government of Canada changed the regulations and we did not have to state the country of origin. We have just released new packaging, watch for it soon, we now state the country of origin, being Guatemala. We are doing this purely to keep our customers informed. Can I shrink my fibroids by drinking a table spoon of grandma’s molasses unsulphured original?